Fiumicino surely holds sway as the greatest leisure sailing centre one of the most important in Italy, on the coast of Lazio. This is due to the large number of boat spaces, in water and on dry land, but above all to its many shipyards, completely artisan and highly specialised, which have always been present in the area. In the last decade it has received new impulse from the economic and employment point of view. 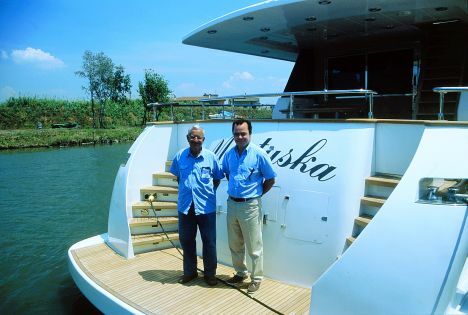 At the beginning of the 1990s Luca Sanpietro bought the Cantieri Navali del Tevere - La Bussola, established in 1964 when the boats were still being made almost exclusively in wood, and today it continues this form of work as its principle activity. In its buildings and along its wharf, under the attentive eyes of the master of wood construction Domenico Zichinolfi - he can boast 60 years of experience accumulated in the shipyards of the importance of Posillipo, Italcraft, Canados and San Lorenzo - its craftsmen have been refitting many wonderful yachts and motoryachts, restoring them to their original splendour. 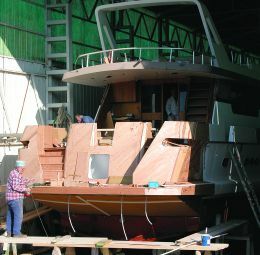 Restyling and both routine and non- routine maintenance, for hulls of lesser nobility have also taken place. In the experience of the company, however, there is also specialisation experienced in the fiberglass or iron processing sector, "sectors in which La Bussola - the owner told us - guarantees the same quality of work". In the shipyard, however, we have seen something which brings us back to our conversation on wood. 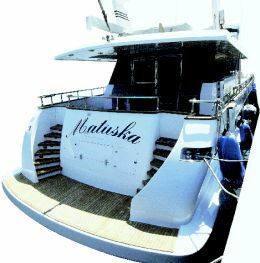 In the water, is a Canados or rather a boat which seemed to be a Canados dating back to the 70's, but with a sumptuous stern transom, equipped with double stairway giving access to the extended beach, undoubtedly more current and useable then the original. " What is it? " It is one of the latest works of this season- Zichinolfi told us - the second of four Canados to which we are giving a "second life", constructing a new stern. We have not intervened on the waterlines, which remain identical, but simply applied a new stern transom above the existing one, which blends in with the elegant overall design of the boat, which even after many years has not lost its charm. The greatest difficulty is that of containing the maximum weight of the new part, a body around 400/450 kilos, constructed in wood, so as not to undermine the sailing abilities and above all the boat speed. The tests carried out with the new stern, have told us that after the modification, the boat has only lost a single knot in the maximum performance, leaving the sea abilities identical". To the question whether these types of activities are carried out only on the Canados, Luca Sampietro answered " I don't think we would have difficulty in repeating this type of work on different boats and of other shipyards". For information: Cantieri Navali del Tevere - via della Scafa, 65 - 00054 Fiumicino (RM) - Tel +39 06 6580323 - Fax +39 06 6580945.